Regena-Slim utilizes two powerful ingredients working together to reduce your hunger cravings by triggering your body to produce serotonin. Low serotonin levels are associated with weight gain, depression, anxiety, sleep disorders. The (HCA) found in garcinia cambogia blocks the production of enzymes that slow down your metabolism and prevent calories from being stored as fats. 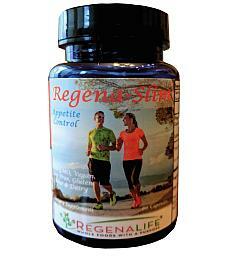 You will be able to lose weight faster with our Regena-Slim Appetite Control that uses both Garcinia Cambogia and 5-HTP at the same time. These two naturally occurring supplements have been shown to curb emotional eating and suppress appetite. The combination of these two effects can provide substantial health benefits to its user. Studies indicate that both of these supplements promote a better quality of sleep when they taken it on a regular basis. Numerous studies have been conducted on Garcinia Cambogia and 5-HTP to show how well they help to promote weight loss. 5-HTP can also help increase your mood. In fact, it is often recommended to reduce feelings of anxiety and depression. That is why it is effective for controlling emotional eating. The increased serotonin levels in the brain are known to be the reason for the improvement in mood.